SAUDI ARABIA wants to transform Aramco from a leading oil and gas company into a fully integrated, truly global energy and chemicals enterprise with extensive operations in the kingdom and around the globe over the next 10 to 20 years, says Aramco CEO and president Khalid Al Falih. “We want to become a competitive global player that not only leverages the best technologies, but also develops and produces them. And we want to use this transformation to help facilitate a globally competitive Saudi energy sector and a sustainable and diversified expansion of the kingdom’s economy. 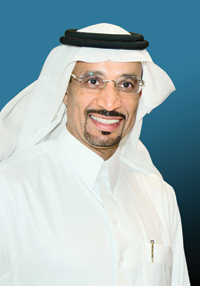 In a nutshell, we want to unlock the potential of our people and our enterprise to transform from a company of which the kingdom is proud into a company of which the world is proud,” Al Falih says in an interview. To tackle the challenges and opportunities identified during that strategic review, an Accelerated Transformation Programme (ATP) was officially launched by Al Falih and members of corporate management during the annual post-board meeting Business Plan Road Show. In this interview published on the Saudi Aramco website, the CEO and members of corporate management were asked about the aspirations, design and execution of the programme. Over the coming months, Saudi Aramco will share more specifics of this far-ranging effort to shape the future of the company. How would you like to see Saudi Aramco develop over the next 10 to 20 years? Gradually, through incremental changes and the odd improvement here and there? Or fulfilling its full potential through a fundamental transformation, not just reacting to events but creating new opportunities and proactively shaping its operating environment – inside and outside the company? Al Falih: That is the subject of an important new endeavour. Leading companies periodically undertake major strategic reviews of their business and its challenges. That is just what Saudi Aramco started a year ago, when management launched a strategic review that involved detailed assessment of global and regional trends, and the business challenges potentially affecting the company over the coming two decades. Workshops involving a broad segment of the company’s management performed diagnostics to identify major issues, including evaluating the existing business portfolio and institutional capabilities. The goals included identifying strategic growth opportunities, revalidating major existing business strategies and developing new ones where appropriate, as well as evaluating the company’s long-term strategic direction. Saudi Aramco is doing well, so why the need to transform? Al Falih: Saudi Aramco is indeed doing well, whether in terms of financial standing, growth, performance, reliability safety trends, or other aspects of its business. Many companies transform because they are faced with adversity, but the best transform while they are doing well in order to capitalise on opportunities and realise their full potential. This is what we intend to do: transform to unlock the full potential of an already successful company. Our transformation aims to take Saudi Aramco to a higher platform of performance and achievement. We are doing it from a position of strength, and frankly, there is no better time to transform. We have tremendous potential to achieve more – much more than where we are, and this transformation is all about unleashing that potential. In thinking about this, we can use the analogy of a Formula One racing car. If you have a car capable of travelling 300 kilometres per hour, the vehicle’s potential is wasted driving on the street, and it’s even worse if you have put in some of the stop signs and traffic lights yourself! To make the most of that car, you need to upgrade certain parts, make sure you’ve got world-class drivers, and let it loose on a track like Monza or Nurburgring. That’s when you can truly unleash its full potential. Could you outline broadly your aspirations over the coming decade? Al Falih: Over the next 10 to 20 years, we want to transform Saudi Aramco from a leading oil and gas company into a fully integrated, truly global energy and chemicals enterprise with extensive operations in the kingdom and around the globe. We want to become a competitive global player that not only leverages the best technologies, but also develops and produces them. And we want to use this transformation to help facilitate a globally competitive Saudi energy sector and a sustainable and diversified expansion of the kingdom’s economy. In a nutshell, we want to unlock the potential of our people and our enterprise to transform from a company of which the kingdom is proud into a company of which the world is proud. During this transformation, the company will focus on enhancing its agility, flexibility and the speed with which it makes decisions. We will also emphasise the role the young generation, to whom we will pass the leadership responsibility to carry forward in the future. We’ll do this by focusing not only on preparing them for the company, but also by preparing the company for them. This is why they represent a critical cornerstone of this transformation. Is there a statement that sums up your aspirations for the future? Al Falih: It is called the 2020 Strategic Intent, and it states that “In 2020, Saudi Aramco is the world’s leading integrated energy and chemicals company, focused on maximising its income, facilitating the sustainable and diversified expansion of the kingdom’s economy, and enabling a globally competitive and vibrant Saudi energy sector.” This statement is straightforward on the surface, but within it is a world of possibilities – and tremendous potential. Isn’t a corporate transformation foreign to your culture? Should you be concerned? Senior vice president of Industrial Relations Abdulaziz F Al Khayyal: Since Saudi Aramco’s inception, it has always been changing and transforming to adapt to changing circumstances in the kingdom and around the world. The company has been transforming from a single-purpose crude-oil producer to one that has increasingly become involved in newer and more challenging businesses, the non-associated gas programme, domestic and international refining, chemicals, power and other businesses. However, while we have undertaken transformative programmes in the past, never before has a plan been so ambitious in setting our future goals. Moreover, we have in the past undertaken change in reaction to changing business environments or at the request of our shareholder. This transformation emanates entirely from within, with a desire to shape our future and achieve high aspirations in an entirely self-driven, rather than reactionary, manner. We should all be excited rather than concerned as we move this great company into a new era. How long has this transformation been in the making? What are the steps you took to engage the organisation in shaping the programme? Senior vice president of Finance Abdullatif A Al Othman: We actually began our strategic review exercise over a year ago. It took us a whole year to develop and refine the ATP and bring it to a point where we were ready to launch. This pace was intentional, as we wanted to be as deliberate as possible. There was an early recognition of the need to examine ourselves and our external environment closely before embarking on our journey. So, we intentionally took our time to gather the input, feedback and support from people throughout the company. Numerous full-day workshops were conducted with a significant cross-section of management, and a survey touched 3,000 of our employees throughout our organisations. In addition, more than 15 focus groups contributed ideas. We operated on the premise that a programme that has not been thoroughly vetted is doomed to mediocrity, if not failure. Moving forward, we will continue to engage our people and the organisation at various levels and forums. Visible, tangible results that impact all of us will be critical to strengthening an already excited work force. Can you give us more detail? How is this programme “different”? General counsel David B Kultgen: The ATP was designed with a new governance model not applied before in any of our earlier initiatives. We tried to approach both the design and execution of the programme in a way that would maximise the chances of success. As Al Othman mentioned, we invested significant time and effort – over a year – in understanding both the internal and external context. We listened to a broad cross section of the organisation in defining our strategic vision and designing the programme through interviews, workshops and a comprehensive organisational health survey. The programme has strong, structured governance, including clear charters for each of the 14 programme execution teams formed to carry the programme forward and the main questions to be addressed by each. The Strategy Council will provide overall guidance and policy direction to the programme. Is this programme about Saudi Aramco, or Saudi Arabia? Senior vice president of operations services Abdulrahman F Al Wuhaib: This programme is designed to guide the direction of Saudi Aramco in the future, to accelerate the development of the energy industry in the kingdom, and to support the sustainable growth of the kingdom’s economy. As the steward of the kingdom’s hydrocarbon resources, we have the responsibility to ensure they generate as much value as possible for the kingdom. We will promote a more diversified energy mix in the kingdom, work with various entities on reducing the kingdom’s energy intensity to ensure maximum value realisation from this valuable resource. We aim to leverage our intellectual capacity, supply chain, scale and expertise in supporting the development of the kingdom’s knowledge-based economy and job creation. So really, it’s about both the company and the kingdom. For many years, you have been underscoring the need to create new jobs and to “jump-start” the development and diversification of the local economy. How does the ATP address this desire? Senior vice president of engineering and project management Salim S Al Aydh: The future of all nations, and of ours in particular, depends on sustaining an environment where young people can reach their potential. Saudi Aramco’s past is firmly rooted in the kingdom’s reservoirs. We are the custodians of the hydrocarbons beneath our feet. The foundations of Saudi Aramco’s future will remain in those reservoirs, but the kingdom and the company will have a future that is larger and more diverse. The energy of this future resides in the youthful reservoirs of our homes. Investments in education, such as the King Abdullah University of Science and Technology, in the energy and energy-services sectors, in downstream refining and petrochemicals, and in new energy technologies will add sustainable value to our youth, our company and our kingdom. This transformation is about developing the reservoirs in our minds as well as the reservoirs in our rocks. It is about intellectual as well as physical infrastructure. It is about the ongoing drive to unleash the full competitive potential of our people. What are the specific areas on which this transformation will focus? Senior vice president of downstream Khalid G Al Buainain: The first wave of the ATP is composed of 14 individual initiatives that are designed to create a proactive approach to business strategy; support the kingdom in building a vibrant energy industry; deliver an agile, flexible and efficient organisation; and improve our leadership engine and work culture. The ATP will provide greater clarity of our strategy, unlock the potential of the work force and fine tune the organisation to be successful in making the leap to the desired level of performance. What’s in it for the workers? Why should they be excited? Senior vice president of Upstream Amin H Nasser: Everyone will be touched one way or another by this programme, wherever they work, whatever they do for the company and however they contribute to its success. The ATP strives to provide a much clearer strategic direction that is understood across the company, a better working environment with less frustration about bureaucracy, and a better way to select and develop the leaders for the future. There will also be a stronger culture of accountability and a clearer link between performance and reward, challenging career opportunities around the globe for the best and brightest, and a more diversified Saudi economy with more high-value jobs and greater prosperity for future generations. What is the key factor for this transformation to succeed? What would cause it to fail? Al Falih: There are many factors that contribute to the success or failure of corporate transformations. Research on thousands of companies that have gone through such programmes indicates that 70 per cent of corporate transformations fail because they did not achieve the desired shift in mindsets and behaviours. That is why in the ATP we must work collectively with renewed mindsets and behaviours, focusing on strengthening our work culture and evolving the right behaviours to achieve our aspirations. We can have the best strategies, systems and processes, but without the right shifts in mindsets and behaviours, we will not realise our potential as individuals or as an organisation. What do you need from the employees? Al Falih: As we embark on this journey, I ask each one to respond to this transformation as if he or she were the CEO of Saudi Aramco. We will need to work together and manage ourselves and our people through this exciting journey. This transformation will bring tremendous opportunities to the people of this great company and the communities it serves, and tangible benefits to the kingdom at large. However, managing expectations will be crucial to our success. It is human nature to want quick results. However, this journey is going to be neither easy nor short, so do not expect things to unfold overnight. For now, I want them to: 1) be motivated by the ambitious aspirations we articulated, 2) understand that we as a company and its people have what it takes to achieve these aspirations, and 3) prepare to evolve our work culture and behaviours to be commensurate with our goals. I am confident that one day we will reflect back at what we are starting right now with a great sense of pride, and think, “This was hard work, but well worth it.” Together, we will get there.